In 1958, a number of people in Dunedin wanted to commemorate the bicentenary of the birth of Robert Burns and to perpetuate appreciation of the valuable service rendered to the early settlement of Otago by the Burns family. The result was the establishment of the Robert Burns Fellowship with its general purpose to encourage and promote imaginative New Zealand literature. The Fellowship is attached to the Department of English at the University of Otago, and was for years the only literary award in the country. 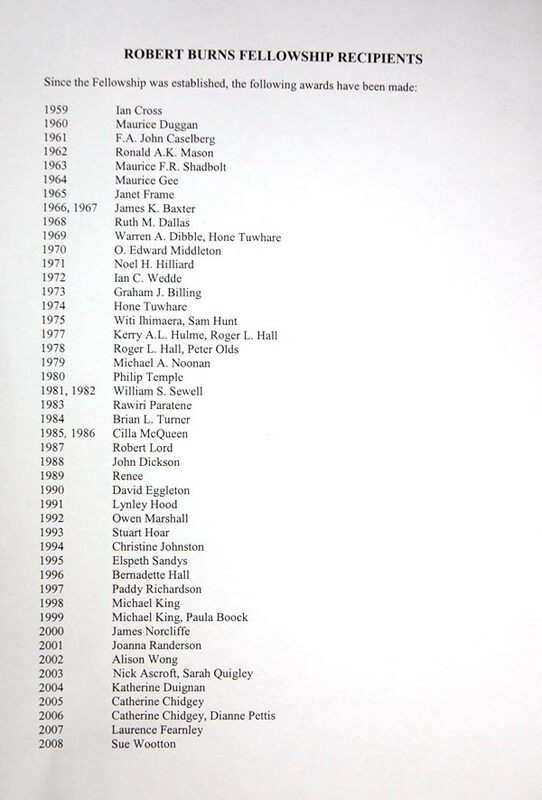 There have been 49 Burns Fellows, from Ian Cross, the first in 1959, through to Sue Wootton, the current 2008 holder. The roll-call is a who's who of New Zealand literature, including among others, Maurice Duggan, R. A. K. Mason, Janet Frame, Ruth Dallas, James K. Baxter, Roger Hall, Sam Hunt, Owen Marshall, David Eggleton, Elspeth Sandys, and Sarah Quigley. All of the Fellows have made a significant contribution to New Zealand's cultural heritage. Nourishing the Roots: an exhibition celebrating the 50th Anniversary of the Robert Burns Fellowship at the University of Otago features books and manuscripts by each of the Burns Fellows, with a major focus on their outputs achieved during their year of tenure. While there are first editions and printed publications on display, there is much on show that up till now has not been seen. This material constitutes manuscripts, draft typescript of poems, books and writings published or not, and the inevitable scribbled notes. All of these ‘unseen' items form part of the creative process; each has a story to tell. Of course, access to such materials has only been possible through the kindness of those Burns Fellows who supplied them for display. Thanks are given to them all. Thanks must also go to Steele Roberts, Hazard Press, Longacre Press, Otago University Press, The Bill Robertson Library, Marti Friedlander, the J.C. Beaglehole Room, Victoria University Library, Wellington, Alan Roddick, Deidre Copeland, and the Janet Frame Estate, for permissions and additional material. A special thanks is given to Professor Lawrence Jones, whose willingness to share the draft text to the forthcoming University of Otago Press publication, Nurse to the Imagination: Fifty years of the Robert Burns Fellowship, has helped immensely. Please enjoy. The Robert Burns Fellowship Hall of Fame, featuring photographs by Reg Graham is situated on the second floor, by the University Library staff room. Please view them. Special thanks to all the Burns Fellows, publishers and individuals who kindly gave their permission to allow the material on this web-site to be displayed.